The Crusades, Christendom’s attempts to win back the Holy Land and Jerusalem, began in 1095 with the First Crusade. The Muslims had taken Jerusalem in 1076. 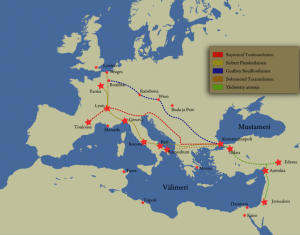 The Crusaders encountered little resistance for the most part, and reached Jerusalem by June 7, 1099. They began their attack on the 13th, and by the 17th, had slaughtered every Muslim in the city. They established the Kingdom of Jerusalem and held it for nearly 100 years. By 1187, however, “Saladin had enough of broken treaties, renegade Crusader Princes’ (see Reginald of Chatillon) attacking Arab caravans and the harassment of his people. Saladin’s army started a march on Jerusalem. His army met up with King Guy [de Lusignon] at the Horns of Hattin on July 4th, 1187. Guy was poorly advised. He was greatly outnumbered but he attacked, and after a long, bloody battle, was taken prisoner. Balian of Ibelin was also captured at this time, but begged permission to return to Jerusalem to look after his ailing wife, the former wife of Amaury. Saladin wasn’t heartless, and allowed Balian to go.